Everything you need for a time saving electric floor heating system install! SunTouch’s open-weave mesh TapeMat can be installed in one day. 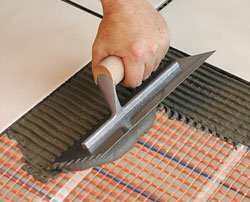 There’s no need to wait for mortar to cure overnight before laying tile. You can achieve warm floors in four easy steps. Simply unroll and attach your mat(s), secure the floor sensor (comes with all SunTouch thermostats), apply thin-set mortar, and install your flooring. • Edged with double-sided tape for fast & easy installation that adheres directly to your subfloor. 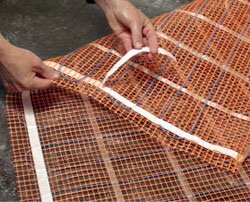 • Mortar bonds easily through mesh with the underlying material. INTERIOR floor heating application only. Embedded in mortar or self leveling concrete only. 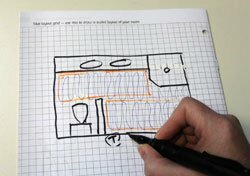 Turn and cut mesh (if needed) to custom fit to your room. Attach mat to subfloor with the built-in tape then mount the SunStat and place floor temperature sensor between 2 heating wires. * Recommended only. Follow local codes for wire gauge size. Install 4-6" away from the toilet drain wax ring. It can be under the front of toilet - Approximately 20" from wall. TapeMat, SunStat Command Programmable Touch Screen Thermostat, Floor Sensor, LoudMouth, Sm. Roll of Double-sided Tape, Digital Multimeter. Detailed Installation Manual. An emerging issue in the electric radiant heat industry is EMF (electromagnetic field) radiation. SunTouch pioneered and sells only ZERO EMF products constructed with active dual wire EMF-canceling technology. All SunTouch products use a complex wire construction with two heating elements in parallel with an added and patented helical twist to eliminate EMF. 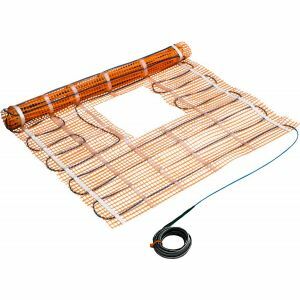 Other electric radiant floor heating companies sell single-wire systems that release high levels of EMF when compared to SunTouch. Is limiting exposure to EMF important? No one is certain. The World Health Organization says the data is inconclusive to date, but continues their research. We provide this EMF information because it is important to some people, not to frighten you or exaggerate any risk. For many years customers have chosen SunTouch Zero EMF systems, but we leave the choice to you after explaining what we do know.